Ignoring the anti-abortion right has not made it go away. It should go without saying that the bigots behind this mobilization, such as the Pro-Life Action League and Citizens for a Pro-Life Society, care not one iota for women, “disadvantaged” or otherwise. They’re part of a long, right-wing tradition of harassing and shaming women entering clinics and imposing legal restrictions on abortion that make access to services increasingly nonexistent for the majority of women in the United States. Thankfully, women around the country have instinctively responded by starting up Facebook pages encouraging people to counter-protest the bigots who will be showing up at Planned Parenthood clinics. But in what may seem like a strange response, Planned Parenthood has asked that supporters not counter the bigots at their doors. Variants of this argument have been repeated as pages advertising planned counter-protests go up — and once protest planners get word, directly or indirectly, that Planned Parenthood doesn’t want them there, they quickly drop or change their plans. But it’s worth questioning these arguments, as well as the effectiveness of a strategy of non-confrontation. In fact, considering that fifty new abortion restrictions were enacted across the country last year — bringing the total of new abortion restrictions since 2010 to 338 — there is a lot of reason to do so. First, everyone who goes to counter bigots during clinic defenses is doing so because they care deeply about women’s safety. Many of us are patients ourselves. Like anything else, patients likely have a wide range of reactions and responses when they go into clinics during a demonstration. Certainly, abortion rights activists should do everything we can to create an affirmative atmosphere for women going into clinics, with signs showing our support for whatever decisions they make. But it bears repeating that what makes women feel frightened or intimidated are the anti-choice bigots themselves — many times with fake pictures and/or religious paraphernalia designed to guilt and shame women out of their decision — not the clinic defenders. It’s also worth pointing out that many patients appreciate the support of clinic defenders and are glad to see someone standing up to clinic harassment. Again, many clinic defenders are themselves patients. The argument that the strategy of non-confrontation is about patient safety implies that clinic defense is not about this, as well. But, of course, the entire reason that we want to confront right-wing, anti-women bigots is precisely because we can’t allow them to grow and gain confidence. That is, in fact, what makes women unsafe. Given that we’re living under the presidency of a man who actually bragged about sexually assaulting women, and that the Right has gained renewed confidence from his victory, we need to think seriously about how the strategy of non-confrontation has enabled the Right. On the one hand, we’re told to ignore the bigots, and they’ll go away. On the other, we’re told there’s nothing new about this moment, because the Right has been protesting at clinics across the country for years now. First of all, this is a contradictory argument. Ignoring the bigots under the prevailing strategy of non-confrontation hasn’t made them go away. On the contrary, if the anti-abortion side isn’t challenged, they gain confidence to show up again. The presence of bigots at the clinic doors shouldn’t be considered “normal.” We want to build a movement that says that no women should ever face harassment at a clinic. Counter-protesting them on February 11 is a step toward building that. It cannot be said enough how appreciative patients are of the services that Planned Parenthood provides. This is no doubt the reason that so many have unquestioningly and immediately complied with the organization’s request not to counter-protest in its defense. But while Planned Parenthood providers are the experts when it comes to reproductive health, they are not the experts when it comes to political strategy. Right now, in fact, they are squandering an opportunity to bring tens of thousands of women into the streets to defend our clinics and drown out the minority of bigots. Rather than a strong defense of the need for safe, legal, affordable abortion without stigma or apology, their strategy has been to downplay the fact that they even provide abortions and play up everything else that they provide. It’s true that Planned Parenthood provides a range of services, but those services aren’t the reason Planned Parenthood is under attack. It’s under attack because it is an abortion provider, not because it provides cancer screenings or pap smears. Planned Parenthood’s line that abortions are a small percentage of the services it provides or bragging that it actually “prevents abortions” only cedes ground to the Right. What we need is a loud, confident movement of women who can tell the truth: There’s nothing wrong with abortions. It’s a safe, medical procedure that around one in three women decide to have at some point in their life in order to terminate an unwanted pregnancy. And when they can’t obtain a legal abortion, women are forced to carry their pregnancy to term — or seek illegal abortions performed in “back alleys,” oftentimes under dangerous and unsanitary conditions where they are vulnerable to abuse by unregulated providers. Abortion isn’t “immoral,” like the anti-choicers preach. But forcing women to carry an unwanted pregnancy or risk their lives seeking an illegal abortion are. A woman alone — not her family, the government, or religious institutions — should be in charge of deciding her future. Without the right to abortion and unhindered access, she has no choice. The right-wingers think they have the moral high ground because they’ve been allowed to perpetuate the argument that the life of “the unborn” takes precedence over the lives of living, breathing women. Our side — the majority of people who support Roe v. Wade — have to make our voices heard. This struggle extends far beyond Planned Parenthood. This is about building a loud, confident movement that can beat back the right-wing onslaught and the bigots who have made it all too clear that they’re coming after our rights. Planned Parenthood shouldn’t be the sole determining voice on strategy for such a movement. Emboldened by Trump’s victory, anti-abortion forces are taking their message to the streets and the clinics in actions on February 11. 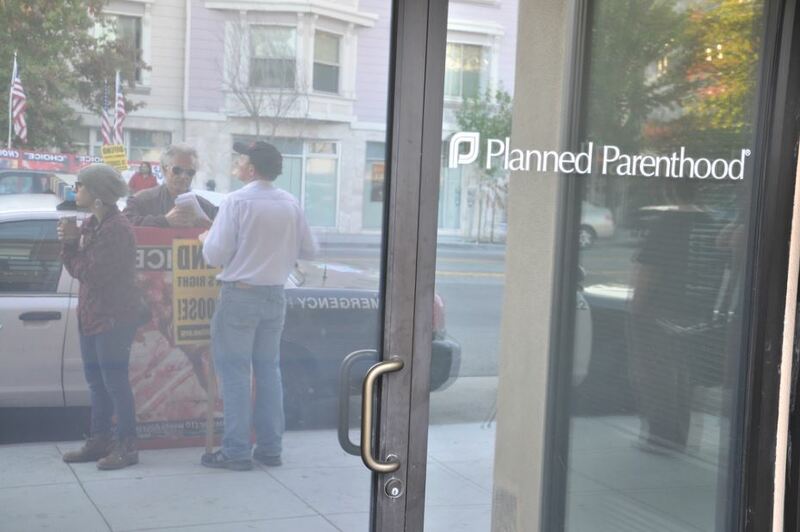 Ultimately, they want to see Planned Parenthood completely closed. But even if Planned Parenthood can withstand these attacks from the Right, smaller, independent women’s health-care providers are more vulnerable if we don’t push back against the anti-abortion protesters. Planned Parenthood’s strategy of discouraging pro-choice forces from protesting the anti-choice bigots at their clinics isn’t a new one. For several decades, the focus has been on passively writing letters to members of Congress or fundraising campaigns. But it doesn’t mean this is the right strategy. Past struggles show why it’s important to take the anti-women bigots head on politically, with loud and confident protests that aim to demoralize them and break their confidence to come back again. When anti-abortion Operation Rescue activists toured the country with large mobilizations in the late 1980s and early 1990s, they were able to shut down clinics in places like Wichita, Kansas. But when they went to Buffalo in 1992, they were met with protesters who organized to defend the clinic with a loud, pro-choice presence. They had to turn tail and leave. During these protests, abortion providers were happy to see the right wing defeated by pro-choice protesters. At the huge women’s marches in Washington, DC, and around the country on inauguration weekend, women and men voiced their loud opposition to Trump’s election and showed that many people are ready and eager to come together to actively protest in defense of reproductive rights. Lichi D'Amelio is a New York City–based activist and a member of the International Socialist Organization.